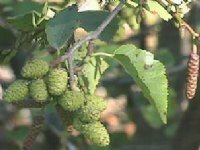 A moderate size tree or large shrub found in damp woodlands or by streams. Catkins are formed in the autumn, the fruiting ones have scales similar to small fir cones. Flowers in April/May. As a decoction alder bark is said to give gentle relief from constipation. (Dried bark 1-2 yrs old preferable.) Culpeper recommended a decoction of the leaves for inflammations, the bark having anti-inflammatory properties. 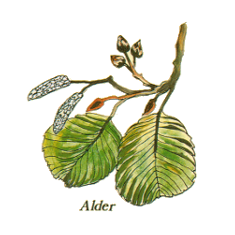 Because Alder is a very durable in water it has long been used for pumps, troughs and sluices. The wood has been used as piles for buildings in Venice. The bark was used by dyers and tanners. The leaves have a slightly sticky suface and so were often used to catch fleas.